There's nothing like having a special place in which to practice your art, including pottery. It allows space to spread out, as well as peace and quiet when you want to concentrate. However, finding the right space, whether it's at home or at an outside venue, isn't always easy. Important concerns include not only how much space you actually need, but also safety issues such as ventilation. Before committing, ask yourself some questions to find the perfect space for a small pottery studio. First, define how deep your interest in working with clay goes. Are you just trying ceramics out? You might not be sure how involved you really want to get. 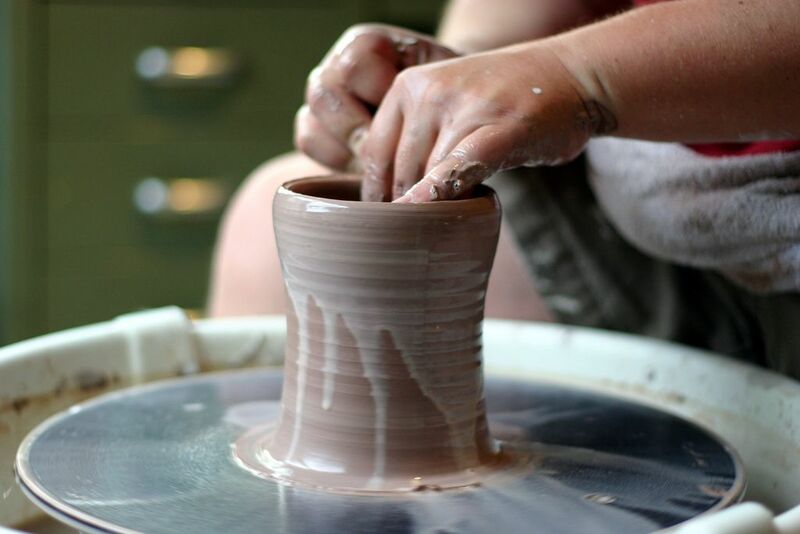 Are you just getting started as a potter but want to really develop your talents? Are you serious about being a potter but you have been working in someone else's space, perhaps as a student or as an apprentice? 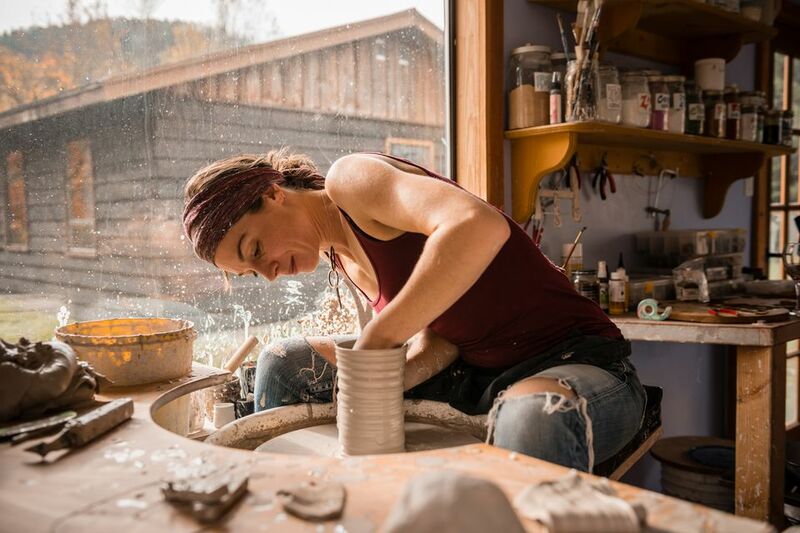 Being honest with yourself can help you determine if you need a small pottery studio to call your own or if it would be better to start out working in someone else's space until you have grasped your interest level. What Space Is Already Available? The most convenient option is a space that's already unoccupied and ready to be converted to a studio that can be retrofitted to provide what you need. If you won't be working intensively, you may be able to create a studio from a spare bedroom. Perhaps there is a porch on your house that you could enclose and make into a studio. For higher levels of involvement, you may consider converting outbuildings on your property or perhaps your garage. You may even decide to build a freestanding studio. You may decide to rent studio space. In some cities, you may find rental space that is already set up for pottery, complete with kilns and ventilation systems. Check with local potters, artist associations, and art centers. Are You Hand-Building or Throwing? If you are building pots by hand, you will probably require less space than if you have a potter's wheel and are throwing. You can easily build pots by hand on your kitchen table and still be able to clean up for dinner quickly. Consider, though, if you are hand-building, how large of a table will you need to work on your pieces? Throwing is also inherently messier, and it will inevitably leave splatters on your walls, floor, and furniture. In addition, the wheel itself takes up more space, so consider whether you'll use a smaller electric wheel or a bulkier kick wheel, as well as how much table space will you need for wedging and modifying thrown pots. How Often Will You Work? You have now defined your level of interest and whether you will be hand building or throwing, or both. It is time to consider how many pots or sculptures you will be creating and how large you will be working. For example, if you will only be making one or two small pieces in a month, the best clay space for you will be quite different than if you will be throwing hundreds of large pots in a week. Materials storage is where you will store your supplies. This includes wet clay, clay scraps for recycling, slurries and slips, and glazes. Depending on your needs, it may also include dry clay and glaze ingredients. Shelving for your ware gives pots and other clay objects a spot to dry slowly in a place where they will not be jostled or bumped. Also, consider that just thrown pieces need to remain on the bat until they are dry enough to remove. You will need to have enough shelving available for both your greenware and for bisque pots that are waiting for their glaze firing. Keep all ceramic materials out of the reach of children, pets, and wildlife. Store all toxic substances in tightly sealed metal or glass containers. Mark all containers used to store toxic substances as poisonous. For container storage, locked cabinets or cupboards are best. Clear labels are essential to studio organization. Labeling everything is helpful, but it's especially important for those clay bodies and glazes that are toxic if ingested or inhaled. What Lighting and Electrical Do You Need? You don't need full-spectrum light for pottery, but you must have good lighting in your workspace. The best lighting will be ambient rather than spotlights. When determining your lighting needs, measure and calculate the cubic footage of your studio space. For example, if a space is 10 feet by 10 feet with an 8-foot ceiling, multiply all the sides together to find that you have 800 cubic feet of space. One watt of power is considered adequate to light 2 cubic feet of space. For our example, therefore, you will need 400 watts of lighting. To meet that amount, you could use four 100 watt bulbs or six 75 watt bulbs. Another question to answer: Do you plan on renting kiln space from another potter, or installing your own electric kiln in your studio space? Most electric kilns require heavy-duty electrical wiring, similar to those used for washers and dryers. Always have a qualified electrician put in the specified wiring for your particular kiln. You need access to water for working with the clay and cleaning up afterward. Clay and other ceramic materials should never go down your drain. Clay will eventually clog your plumbing, and glazes often contain environmentally unfriendly chemicals that can be hard for sewage systems to filter out. The easiest way to prevent clay going into your plumbing system is to use a series of buckets. One bucket should be for the first rinse to wash your hands and tools. The majority of particles will remain in it and can be recycled with your other clay. A second bucket will catch almost all remaining particles on your hands and tools. If desired, you can use a third bucket as a final rinse before washing your hands in a sink. Every firing releases some amount of toxic gas from the clay bodies and glazes.​ Kilns should never be used in an enclosed space unless a proper ventilation system has been installed by a licensed HVAC professional. You will also need special ventilation if you will be mixing your own clay bodies and glazes or using an airbrush. The room used for mixing should have its own ventilation system, and airbrushes should be used only in a vented spray booth. In both cases, you should wear an appropriate respirator.